The lights would stay on if California utility giant PG&E Corp. files for bankruptcy. But the company, its customers and investors would be set for years of uncertainty. PG&E plunged 22 percent Monday on news that it’s exploring a bankruptcy filing in response to an onslaught of wildfire liabilities that are estimated to be as high as $30 billion — far exceeding the company’s market value of less than $10 billion. 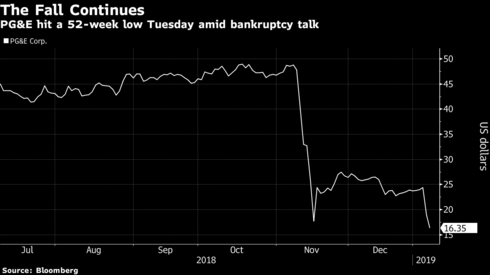 On Tuesday, the company fell as much as 17 percent after S&P Global Ratings downgraded the San Francisco-based company’s long-term credit rating to junk, and said the utility remains on a negative watch. The bonds hit all-time lows. A potential bankruptcy is seen as putting pressure on California lawmakers to provide a bailout and avoid more turmoil for the state’s largest utility. Whatever the outcome, bankruptcy tends to be “massively inefficient,” said Severin Borenstein, an energy economist at the University of California, Berkeley. PG&E has faced bankruptcy previously. Its Pacific Gas and Electric utility filed for bankruptcy in 2001 as soaring wholesale power prices and rolling blackouts threw California into crisis. The PG&E Corp. holding company itself never filed for bankruptcy. The utility emerged three years later, its business intact. Under the reorganization plan, ratepayers were responsible for $7.2 billion of the company’s debt from the electricity crisis. A PG&E bankruptcy isn’t “likely” at this time as the company can tap other sources of cash, either through the sale of its natural gas unit or other real estate, or a cut in its $5.5 billion capital spending plan, analysts at Mizuho Securities USA LLC led by Paul Fremont wrote in a research note Tuesday. Fremont cut his price target on the shares to $19 from $27. “There are other sources for cash the company can rely on to avoid bankruptcy,” Fremont said in the note. Last year, Energy Future Holdings Corp. was forced to sell off its electricity distribution business in Texas to Sempra Energy as part of a tortuous four-year bankruptcy proceeding. And the Puerto Rico Electric Power Authority, which filed for bankruptcy in 2017 due to mounting debts, now plans to hire a private operator to manage its electricity grid. Then, unscrupulous energy traders and companies — most notably, Enron Corp. — exploited flaws in California’s recently restructured electricity market to send wholesale power prices soaring. Utilities, their rates regulated by the state, couldn’t pass those cost increases on to their customers. At the time of the filing, PG&E’s debts were reported to be rising by $300 million per month. State investigators have blamed PG&E’s equipment for starting 17 of the wildfires that tore across Northern California in 2017. Those investigators are now exploring whether a PG&E transmission line started November’s Camp Fire, which leveled the Butte County town of Paradise and left 86 people dead. Since then, state regulators accused the utility owner of breaking natural gas pipeline-safety rules and falsifying records. On Tuesday, PG&E’s utility promoted Michael A. Lewis to senior vice president of electric operations effective today, less than a week after the holding company said it was weighing changes to both its board and how its businesses are structured. California politicians have been considering legislation that would help PG&E pay off lawsuits related to the Camp Fire, and one veteran lawmaker has publicly questioned whether the company was using the specter of bankruptcy to pressure Sacramento. In 2001, Pacific Gas and Electric filed for bankruptcy while bailout talks with then-Governor Gray Davis were well underway. Davis, blindsided by the filing,called it a “slap in the face to California,” according to local reports at the time.